The most efficient petrol cars and why you should ditch that diesel! It is a well known fact that diesel cars aren’t exactly the flavour of the month at the moment, so many motorists are considering alternatives. These switches include hybrid and turbocharging technology, which means that on paper petrol engines can offer a lot of impressive economic figuress. So, if you tend to travel less than 10,000 miles a year, a petrol car probably makes sense for you. Here are some of the top fuel-efficient petrol and hybrid cars to think about purchasing as your next motor. The punchy 1.0-litre TFSI engine is the Audi A1 supermini, which offers performance and economy figures that’s not a lot behind the 1.6-litre TDI. CO2 emissions of 97g/km is lower than the diesel’s 99g/km, while the petrol version is roughly £1,000 cheaper to buy. Launched roughly a decade ago, the Alfa Romeo MiTo is now showing its age. In reality, there’s little to recommend it over the new wave of supermini’s, although the TwinAir engine is still pretty delightful. This small city car is pretty impressive compared to its diesel comparison. Sadly though, the brand’s no turbocharged 1.0-litre TSI version cannot reach the heights of 68.9mph, but the standard 60hp Up is ok if you don’t tend on going far from the city. Toyota offers no fewer than seven Aygo models. These range from the ‘x’ to the x-clusiv and limited edition x-claim. Based on the claimed fuel economy, the 1.0-litre engine shouldn’t be, ahem, expensive to run. Perhaps opt for the automatic version when the economy drops to 67.2MPG. Take a look at our other news today. Plus, be sure to enquire about our luxury hire cars. It has been approximately 25 years since English football went all champagne with the birth of the Premier League. Since then, a lot has changed in the world of football, and not just matters according to the pitch. Whilst television revenue has transformed the industry, and there’s enough cash floating around to make players the richest sportsmen in the world, of course they can afford their pick of cars available in the most lavish showrooms. We all have our ideas with regards to what should/may be the most popular car purchased by Premier League footballers. Although, some of you may be surprised with the official listing that’s been revealed (we have been). Finishing in first place is the Range Rover Evoque. With a very modest starting price of £30,769, the Evoque is a shock considering the average salary of a premier football player being £2.4 million. However, we may suggest that the Evoque is just one of a stable of cars earned by each footballer. This may be a tender to a fleet of land-yachts and exotics. Of course, this is most probably the most ideal car for the school run or nipping to town on the list (which is seen below). The other cars on the list are slightly more predicable. They are listed below from the most to least popular. Additionally, it is hard to understand why so many player’s cars are bought on finance when they earn so much? Let’s be honest here, Wayne Rooney could buy an Evoque with the money he earns in one day. Get in touch if you wish to hire a luxury car and feel like a celebrity footballer whilst travelling. Due to customer demand, automakers are dishing out SUV’s in every single possible size, shape, and flavour. There’s a growing list of options becoming available, which includes the 2017 Mercedes-AMG GLC43. The replacement for the GLK is a handsome SUV equipped with a clean-cut exterior that is sublimely sophisticated. Entering the GLC is easy, and the passenger compartment is surprisingly spacious. The leather seats and door trims are complimented by high-quality plastics and vinyl. The seats are supportive, and super comfortable. The AMG is equipped with an impressive 3.0 litre, twin turbo V-6 and is offering 362 horsepower and 384 pound-feet of torque. Its nine-speed automatic and full 4MATIC all-wheel-drive system has been finessed by Affalterbach’s finest too. The turbo lag is virtually non-existent to the V-6. Whilst the motor is at full power you are able to feel full vibrations through the steering wheel. If you’ve heard that Mercedes is nailing their engines, then you have certainly heard correctly. The modified air suspension has helped the AMG be a fast improvement on past models. Whilst cycling through the various drive modes there are changes to the parameters that we can only expect from Comfort to Sport. If you find yourself driving the AMG on twisty mountainous roads, you will find that the GLC43 has superb composure and impressive eagerness. The quickness of the steering wheel is great. Basically, the 2017 Mercedes-AMG GLC43 is an impressive graduate on the AMG’S boot camp. It features sensible balances of driving dynamics, practicality, comfort and luxury, whilst still being hugely competent and affordable. 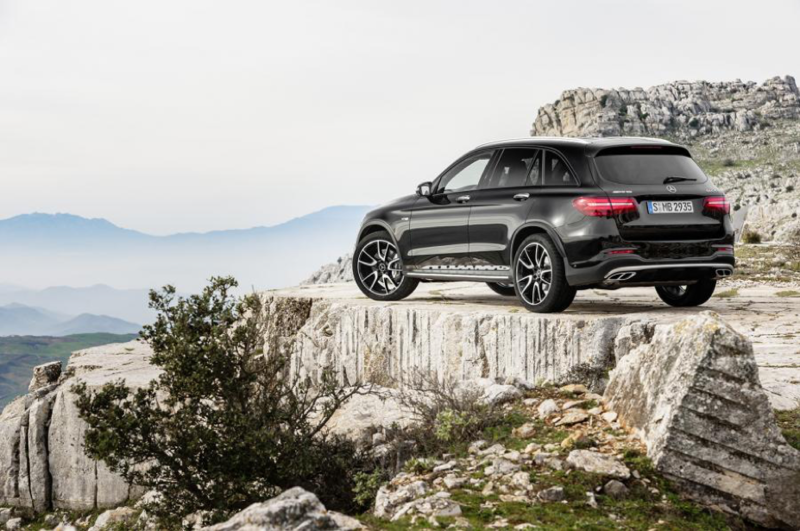 The Mercedes- AMG GLC43 will set you back roughly £36,500, but if you opt for the sport version you can expect to pay out roughly £40,000, which is quite a hefty difference. Either way you will certainly be travelling in style, arriving to each location with the wow factor. Hire one of our Mercedes today at www.limobroker.co.uk. Or, contact us for a quote on any of our other car hires. We have an impressive range which is guaranteed to meet all of your transport needs.